for use on Twin Cam motors. 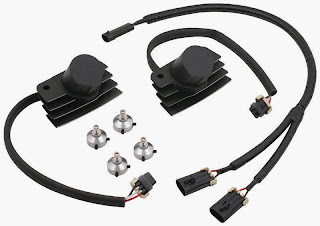 The new coil design hides all the ignition wiring in the head of the coil pack, eliminating the need for spark plug wires, and it is also claimed to provide quicker engine starting and improved throttle response. Available in either black or natural finishes, the Stealth SuperCoils mount directly to the spark plug and feature a cross-functional aluminum cast cover that acts as a heat sink, pulling heat away from the cylinder heads. ACCEL's new coil system requires no cutting or splicing of the factory wiring harness and uses Delphi connectors to make installation plug and play. The coil features a claimed faster rise time and higher voltage than traditional systems, meaning the plugs receive maximum spark energy and perform better. The Stealth SuperCoils are covered by ACCEL's limited lifetime warranty. "We've taken proven automotive technology and adopted it to the H-D Twin Cam engine, bringing to market a product that seamlessly combines a new look with the unmatched ignition performance that ACCEL is known for," said Jason Ellison, Product and Sales Manager for the ACCEL Powersports division. "The increase in performance I've experienced first-hand during test rides is impressive and we're incredibly excited to introduce this innovative product."